Only a handful of early dwellings on island were constructed of brick. 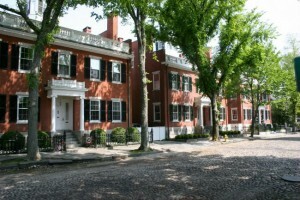 The costs associated with transporting brick made it a material for only the wealthiest on Nantucket. Prior to 1829 brick was used for constructing chimneys and foundations. That year Jared Coffin began construction of his house on Pleasant Street entirely of brick. During the 1830s other wealthy oil merchants followed suit. The most notable examples are Main Street’s Three Bricks as well as Jared Coffin’s second brick house on Broad Street built in 1845. Previous PostFriday Find: Hidden Treasures!Next PostFriday Find: Essex Survivor’s House!